Have you ever sat in bed at night, staring at your phone, and wondered what does your phone case says about you? Is it strong like you? Does it match the way you look? Can it show how you feel? Just like any other piece of clothing, hairstyle, or fashion accessory, our phone case is an extension of us. It shows who we are and what we’re about to the rest of the world. We don’t even have to say a word. It does it for us. Actions speak louder than words, do they not? At Speck, we love phone cases. You may even say we’re obsessed with protecting your tech. That’s because our devices aren’t just for calling or texting anymore. They’re a source of never-ending information, an outlet to escape into music, even a way to capture a moment and make it last forever. 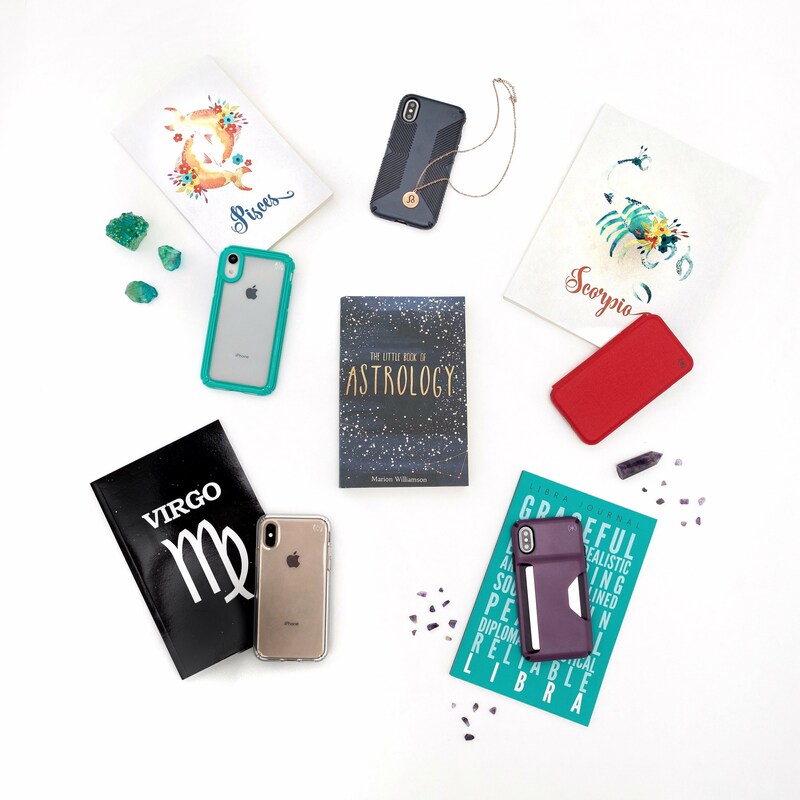 That’s why we’ve put together a list of durable and stylish phone cases that match up with astrological signs and personalities. We had a ton of fun putting this together, and we found that it’s pretty fitting. Hope you find out what your phone case says about you. If you see that you’re not matching, then you may be in the market for a new (or a few new) cases. If you’re into the Presidio Ultra phone case, you’re more than likely an Aries. This durable phone case has up to 15-foot drop protection, and the two-piece design will let you keep diving headfirst into life’s challenging situations. Keep being you, you bold and ambitious ram! Here’s the perfect protective phone case for those weekends in the backwoods and those weekdays in the boardroom. If you’re into the Presidio Inked phone case, I’d put a few bucks on you being a Taurus. Our designers called on their spirit animals to help inspire these stylish phone case designs, much like your celestial spirit animals help you find the mystical environments that provide for life’s beautiful moments. Keep getting in touch with nature Taurus. If the Presidio Pro has your interests peaked, then you’re more than likely a Gemini. It’s built to go anywhere and do anything, much like the Gemini that wishes they could be everywhere and do everything all at the same time. Not only is this soft-touch, slim phone case built to protect against drops from up to 10-feet, but it also has an anti-microbial treatment that inhibits bacteria growth on the case. If the Presidio Metallic is catching your eye, you’re probably a Cancer. Much like the vivid tones and slim lines of this protective case, you too are effortlessly able to project positive energy and good vibes in any room you decide to enter or with any people you meet. Keep reflecting off the good light you luminous Cancer you! Ahh, the Presidio Grip. If you’re falling for this bold and brawny protective phone case, you’re more than likely a Leo. This iconic design basks in the spotlight and shouts from across the street, wanting to be seen, much like any lion. It’s a durable phone case for the animated, the passionate, and those that aren’t afraid to celebrate themselves or the fact they have 10-foot drop protection. Clear-cut protection in a clear phone case is a beautiful thing. And there isn’t an astrological sign that will understand that fact more than the Virgo. You’re a bit of a perfectionist (in a good way), and your deep-rooted in logic and love for the material world makes this scratch-resistant clear phone case the perfect match. So, go ahead, showcase your smartphone and add up to 8-foot drop protection. You’re too predictable Virgo! Now, the Libra took some serious time to figure out. Their constant fixation on balance and harmony were at the forefront of making this decision for their perfect phone case. Seeing as they’re also obsessed with symmetry, we thought of the Presidio Wallet as a great fit. They usually strive to have all aspects of their life covered, much like the Presidio Wallet phone case provides protection and allows you to carry cash or up to three forms of ID or credit cards. Libras, you can have your cake and eat it too, and look good doing it! If you’re fancying The Presidio Folio, you may as well be a Scorpio. This folding phone case is for the passionate owner that needs, and wants the ultimate amount of drop proof protection and screen protection. However, since you have a deep sense of emotion for artistic sensibility, you don’t want to project a “sporty” look. That’s why The Presidio Folio projects the perfect combination of power and grace for the Scorpio in you. The Presidio Sport phone case is built to go anywhere and withstand anything. Much like any Sagittarius and their constant quest for experience and knowledge. If you’re living a life of continuous motion, this is the drop proof, anti-microbial, and stylish phone case that will let you partake in your intellectual and spiritual adventures. The Presidio Sport phone case projects confidence due to its versatility, just like a Sagittarius. The Capricorn was a bit of a long shot, but we’re remaining fairly confident. For the most part, Capricorns are great at bouncing between the physical and emotional worlds. Your love for vanity (but not in a negative way) and respect for the persistence that goes into attempting to maintain perfection is what made us choose The Presidio Clear + Glitter. You’re an Aquarius, one of the most widely known signs in the world. You’re a healer at heart, always in the constant search to do more and make more of an impact. That’s why the Presidio Inked Crisis Text Line phone case is the perfect match for you. Seeing as you’re a pure-hearted humanitarian, a phone case that’s dedicated to helping those in need and protecting your phone against drops and dings is the perfect fit. Never stop being a beautiful soul, Aquarius. The V-Grip is the perfect contrast of concrete protection and transparent clarity. Much like Pisces’s fish swim in opposite directions, showing the fight of fantasy and reality. This phone case shows the beauty of your phone while protecting it with a soft-grip. Feel confident knowing that your phone is safe and looking good, much like the confidence that goes with knowing all the lessons from the other signs. We hope this piece has helped clarify what your case says about you. Our personality shows in every aspect of our outfit, and that includes our phone case. So, make sure to choose one that symbolizes who you are and what you’re about. Remember, actions speak louder than words, and that goes for your case. If you have other ideas for case styles and their personality traits or how they’d match with astrological signs, we’d love to hear them. Keep your tech devices looking great and keep them protected.